Pros know how important it is to have the right gear for the job. You’d never settle for second rate when it comes to your toolbox—so why take chances with your safety and comfort? Reach for the disposable gloves that always meet your demands: AMMEX Gloveworks Black Nitrile Powder Free Industrial Gloves. More than 50 percent thicker than standard nitrile gloves, they’re durable—you won’t have to change them as often over the course of a shift—and strong: Nitrile has three times the puncture resistance of latex. It’s also nearly as elastic as latex, which means a terrific fit every time. AMMEX Gloveworks Black Nitrile Powder Free Industrial Gloves are 5 mil thick in the palm with 6-mil fingertips, so they’re a great companion for tools and machinery. They provide barrier protection from common chemicals like carburetor cleaner, and specialty chemicals like brake fluid. The surface is micro-roughened and the fingertips are textured for gripping power, even when the gloves are wet. The interior is polymer coated for easy donning and doffing, which eliminates the need for powder—and that eliminates worries about messy residue. 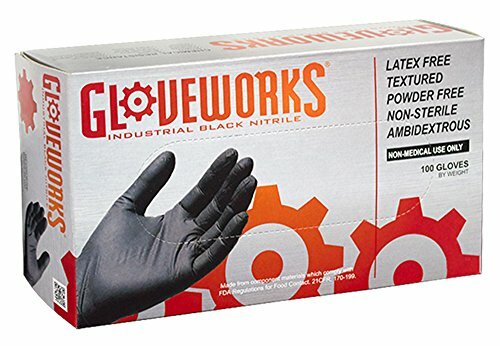 AMMEX Gloveworks Black Nitrile Powder Free Industrial Gloves are popular in a number of industries, especially automotive, Jan/san, safety, and applications involving chemicals. Black is the hottest choice on the market for a cool look, and it hides dirt, grease, and grime, too. The gloves are latex-free and available in an extended size range, from small to XXL, and sold 100 gloves per box, 10 boxes per case. They’re made from component materials that comply with FDA regulations for food contact. As a pro, you need to believe in your tools. Disposable gloves are no exception. Make sure your gear has you covered, starting with AMMEX Gloveworks Black Nitrile Powder Free Industrial Gloves.